The present volume, "e;Fluorine"e; Suppt. Vol. 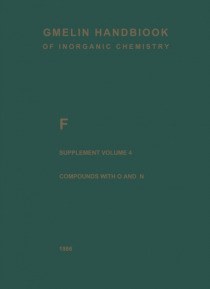 4, covers the oxygen compounds of fluorine and the binary fluorine-nitrogen compounds. In the first part "e;Fluorine and Oxygen"e;, oxygen fluorides OnF m are described in the order of decreasing F: 0 ratio. It finishes with a description of hyperfluorous acid HOF. The second part "e;Fluorine and Nitrogen"e; deals with the bina… ry fluorine-nitrogen com- pounds. They are subdivided on the basis of the number of nitrogen atoms per molecule. Thus, species such as NFt, NF , NF , and NF are considered first followed by the dinitrogen and 3 2 trinitrogen fluorides NF, NF, and NF and related ions. 2 4 2 2 3 The other compounds under the heading "e;Fluorine and Nitrogen"e;, the fluorine-nitrogen- hydrogen and the fluorine-nitrogen-oxygen(-hydrogen) compounds, will be covered in "e;Fluorine"e; Suppt. Vol. 5. Intense development in the field of inorganic fluorine-oxygen and fluorine"e;nitrogen chem- istry began in the middle of the 1950s when in less than a decade numerous previously unknown compounds and a great deal of new information were produced. Research in this field was strongly stimulated by interest in these compounds as potential high-energy oxi- dizers for rocket fuels. That is also the reason why much of the pertinent chemical information is found in patent Iiterature and U.S. Government contractor reports.